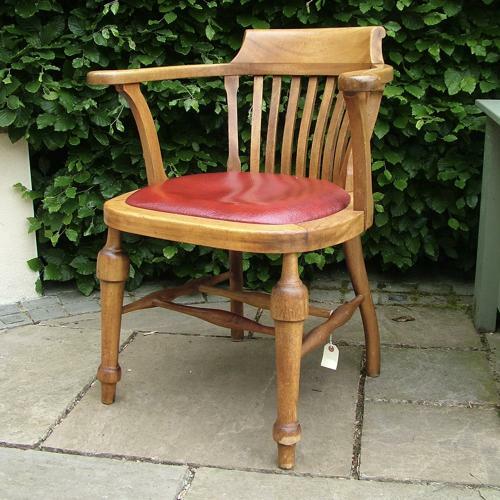 Original wartime period 'Captains' type chair. Solid beech (?) frame with horsehair filled seat pad upholstered in red Rexine/leatherette. This is identical in pattern to the type of chair seen in period photographs of R.A.F Station offices and outside dispersal huts etc. (see photographs 11-13). This example was manufactured by William Hands & Sons Ltd., high quality British furniture makers since 1906. It is stamped with the maker's name, clear 1939 date and faint King's crown and GVI marks. The frame is very sound and has probably been stripped and refinished. There is a small repair in the back of the arm stretcher but this does not detract. The red covering is relatively modern but looks the part. The horsehair padding and webbing support appears to be original and will require attention at some point but has been in daily use in our office for the past year or so without issue. Due to its size this is available for collection only. Alternatively, if you wish to arrange a courier we will provide some basic protection with bubble wrap. We cannot really box this item but will do our best to help. A lovely looking scarce chair with a great date. Stock code C20790.